From its successful run at the Cultural Center of the Philippines, Ron Capinding’s “William” is coming back to the stage, this time at the Star Theater in Pasay City, from January 31 to February 16. “William,” which first opened in 2010 at The PETA Theater Center, earned local and international accolades. Directed by Maribel Legarda, the musical bagged top prizes in the 2011 Philstage Gawad Buhay! Awards, including Outstanding Play, Outstanding Ensemble Performance in Play and Outstanding Original Script for playwright Ron Capinding. “William” also won acting awards for Ian Seguerra (Male Lead Performance in a Play), Meann Espinosa (Female Featured Performance in a Play) and Jojo Atienza (Male Featured Performance in a Play). The play’s characters represent usual High School stereotypes: a shy boy in class, a not-so-smart pretty lass, a bad boy athlete, an eager student leader, and an honor student. As much as these students are part of different cliques, all of them struggle to understand Shakespeare and his works – some find his poetry difficult to understand, others are simply bored with the subject and most simply don’t find meaning in studying Shakespeare. Punished due to their “insolence to Shakespeare,” they are required by their teacher to present a scene of a Shakespearean play, which allows them to rediscover how Shakespeare characters and stories are parallel to their life situations. Running until February 16, “William” lets the audience fall in love with Shakespeare’s stories such as Macbeth and The Merchant of Venice, which the play tones down to have the viewers appreciate its content. “William,” with Shakespeare being a writer of romantic sonnets, is also a story of love in various forms – a daughter’s fading love to a mother, a girl’s newfound love, and a gay student’s love transcending common notions. 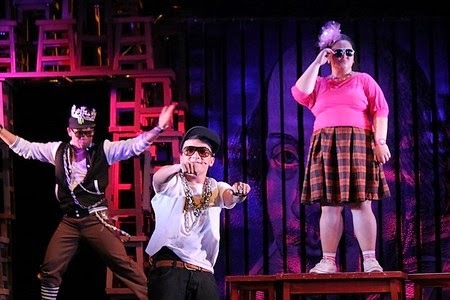 PETA’s rap musical “William” has managed to capture interest of students and local theatergoers, even earning nods from a British news agency. Reminiscent of today’s popular TV musicals such as Glee and High School Musical, “William” is set in a high school in Metro Manila, where five young students are forced to study Shakespeare by their terror class adviser, Ms. Lutgarda Martinez. In the process of studying, these students not only realize the beauty of Shakespeare’s works but also re-discover themselves through Shakespeare’s characters. “William” features 10 original rap songs composed by Jeff Hernandez. Songs such as “Pucha Bro”, “Nosebleed”, “O Shakespeare”, “What’s In A Name” are fusions of various music genres, like rock, soul, funk, RnB and hip-hop. “William” also utilizes an emerging form of rap, FlipTop, which is becoming more popular among today’s youth. These rap numbers, choreographed by John Tan (from Urban Dance Crew), are performed along with various hip-hop forms, such as: crumping, breakdance, ballroom and jazz hip-hop. “William” at the Star Theater will run on January 31, February 1 and 2, February 4 to 7, and February 14 to 16. Purchase a ticket and get a ride-all-you-can pass at Star City for only PHP 600. For tickets, contact PETA at (63 2) 725-6244, (63 2) 4100821-22, and (63 917) 576-5400 or email: petatheater@gmail.com.